Sam Alexander and his mother Eva Alexander are at the local hospital in Carefree, Arizona to have Sam's blindness checked by a doctor. Doctor Kettlewell informs Sam and Eva that the teenager is experiencing an optical migraine which may have been brought on by stress. Sam's doctor asks him if he has recently been hit in the head. As Sam recalls multiple incidents when he's taken a hit, both as Nova and as Sam, he lies and tells his doctor that he hasn't taken shots to the head. As they leave the hospital, the receptionist tries to tell Eva that she needs to pay part of the bill. Sam's mother asks her to bill her as they rush out the door. She tells Sam that they'll pay the bill eventually but they can't afford it right now. Later at Carefree High School, Sam runs into Karl Moffet and Carrie. Moffet begins verbally abusing Sam about his father. 45 seconds later, the two are in Principal Philbin's office for fighting. Instead of giving Sam detention, the principal decides to have the teen join the chess club. He then sends the student to his geography class. While in class studying a map of the United States, Sam begins seeing the lights again. He suddenly realizes that the points of light aren't stress related but are points on a map! However, his disruption of class gets him sent out of the room. After school, Sam enters the chess club. Mrs. Schaefer welcomes him begins teaching the new member the basics of chess. She explains that chess is a game of strategy and starts with the pawn. She explains the role of the pawn and how it can move in one direction but captures in another. The instructor also explains that the most important area of the board to control is the center. She finished their session by explaining that brains counts more than brawn in chess. For example, the king is one of the weakest pieces but the game is lost without it while the queen is the strongest piece on the board. Fifteen minutes later, Sam's mother picks him up and takes him home to babysit while she goes on two job interviews. Later, after Kaelynn goes to bed, Nova is out in the backyard training his aim by blasting bottles and cans off the fence. He stops and wonders how his father could have given up being a Black Nova. A little while later, Eva Alexander returns home and checks on Sam. He is pretending to be asleep until Eva leaves the room. He then puts on the Nova helmet and flies into space. Nova lines up the map of lights in his eyes with the stars. Once everything is set, he warps into deep space. 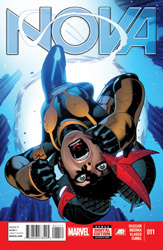 On a planet in deep space, Nova is drawn to a light signal in the shape of a Nova insignia. Arriving at the light, he is shocked to discover a dead Nova Corpsman! However, Sam doesn't have time to investigate as two giant spider creatures attack him! However, before the spider aliens can consume Nova, he rips the head off one of the creatures. He grabs the webbing tongue of the other and smashes him into the ground. With the threat removed, Sam goes to the body of the Nova Corpsman. Nova removes the alien's gold helmet which begins talking to him. The helmet's personal log informs the young hero that the Corspman's name was K'Thol. K'Thol's visual log also shows Sam that he had evacuated all the suvivors but one. K'Thol had remained to find him but was attacked by the spider creatures. The Corpsman reveals that his heart is failing due to the spiders' venom. Suddenly, K'Thol is stabbed through the chest by a giant spider creature. Nova turns to find himself facing the same creature! However, Sam is too fast for the spider alien and flies into the sky. He unleashed a full power blast and vaporizes the alien threat! Later, on Earth's moon, Nova looks at the light map again. He begins to realize that the lights are indicators of dead Novas. He asks the helmet if any Novas can report to him. He receives only silence. Elsewhere, deep in the Melovian Galaxy, a starship commander named Cadivan tells his slave girl how he killed a Nova and took the helmet from his dead body. The Nova helmet sitting as a trophy on his throne suddenly lights up in response to Nova's communication from Earth. Cadivan realizes that the light means there are more Novas to kill.